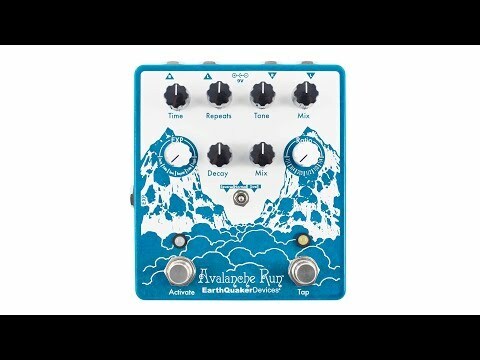 Product Overview The Avalanche Run is a dreamy stereosonic exploratory multi-tool that includes up to 2 seconds of delay time, reverse delay, tap tempo with subdivision control, switchable true bypass or buffered bypass with 5 different tail lengths (including a sound-on-sound style lo-fi looping mode) and an assignable expression control that maps the expression jack to a control of your choice, including the toggle! The delay section allows tweaking from tape emulation to bucket brigade styles with a twist of the wide-range Tone control. The cavernous, plate-style reverb has just a touch of modulation similar to the one found in our precious Dispatch Master only more lush with an adjustable Decay. Otherworldly reverse delay and dynamic swelling reverb settings are accessible through a 3-way toggle switch. • Time: This controls the delay time and goes from 0ms to just under 2000ms. • Repeats: Controls the regeneration of the delay, from zero repeats to near infinite. • Tone: Controls the tone for the delay line only. Roll off highs to the left, roll off lows to the right and get a flat response in the middle. • Mix: The is the volume control for the delay line. This blends in the wet with dry until 1 o’clock, 1 o’clock to 3 o’clock boosts the wet signal over the dry and 3 o’clock up brings down dry until it is fully wet when all the way up. • Expression Jack Assign Switch: Use this switch to map the expression jack to one of the assigned controls. - Time: This takes over for the delay time control and is DRASTICALLY different than the interface control. Using the expression pedal to control the time will give you all kinds of wild effects that can not be achieved by turning the knob. - Toggle: This takes over for the toggle switch and will cross fade from forward delay in heel down position to reverse delay in toe down position. • Ratio Selector Switch: Selects delay subdivisions when time is set by the “Tap” switch. • Decay: Controls the decay length of the reverb, short decay counterclockwise, long cavernous decay clockwise. • Mix: This is the volume control for the reverb. Blends in the wet with dry until 1 O’clock, 1 O’clock to 3 O’clock boosts the wet signal over the dry and 3 O’clock up brings down dry until it is fully wet when all the way up.